Amena talks with speaker, reconciler, and founder of non-profit Be the Bridge, Latasha Morrison. Latasha shares the lessons she’s learned from founding an online community which led to the founding of a non-profit. Amena and Latasha talk about how the practice of self-care is important in bridge building work and how Latasha stays grounded as her organization is growing so quickly. For more information about Latasha, visit https://latashamorrison.com/ and for more information about Be the Bridge, visit https://beabridgebuilder.com/. Tasha is a bridge-builder, reconciler and a compelling voice in the fight for racial justice. When she speaks, she expresses a passion for social justice issues across the globe. At the heart of this incredible woman, Tasha uses her platform to encourage racial reconciliation among all ethnicities, to promote racial solidarity in America, and to develop others to do the same. With a Master's in Business, she educates on disparities and injustices and creates spaces for positive dialogue around racialization. A gifted speaker, Tasha travels the country challenging audiences everywhere to step outside their known, safe worlds in order to connect with others who are different from themselves, changing the world one dinner table at a time. She has simultaneously cultivated "Be the Bridge," a non-profit ministry to equip and provide tools for those who are actively involved in taking the next steps toward racial reconciliation. When not captivating audiences with her dynamic presentations and conscious raising workshops, Tasha can be found exploring her hometown of Austin, Texas, drinking tea, laughing with friends, viewing Christmas movies and listening to Christmas music all year long! Find Latasha on her website, Instagram, Facebook, and Twitter! Amena talks with her sister, visual artist and author of Afro-feminist coloring book Avie’s Dreams, Makeda Lewis. Makeda shares her creative process and what grounds the art she makes. Amena and Makeda also discuss the tensions between business and making art and Makeda shares why it’s important for community engagement to be a part of art making. Stay tuned until the end to hear Makeda’s unique twist on her nominee for a She Did That Award. Based out of Atlanta, Makeda Lewis is all hard-softness and imagination. She is an illustration and multimedia artist, primarily working with ink and paper and plexiglass, focusing on themes of isolation, quiet anger, and love. She also works with non-profit and arts organizations to create programming around community engagement with the arts and art history. Feminist Press published her coloring book Avie’s Dreams in 2016. She has been featured on nylon.com, bet.com and various artist/author talks along the east coast. She is 27. Find Makeda on Instagram, Twitter, and Tumblr! Alia Joy is an author and speaker who shares poignantly about her life with bipolar disorder as well as grief, faith, marriage, poverty, race, embodiment, and keeping fluent in the language of hope. Sushi is her love language and she balances her cynical idealism with humor and awkward pauses. She lives in Central Oregon with her husband, her tiny Asian mother, her three kids, a dog, a bunny, and a bunch of chickens. Kathy from Twitter: Can you list your favorite Korean American women and what would you eat with all of them? Alia’s answer: I can! My favorite Korean American women would have to include my mom and daughter and we’d be eating sushi because it’s my favorite, or if it was home cooking, my mom’s fried rice. Then I’ve got to give a shoutout to Kathy Khang, Tasha Burgoyne, and Grace P. Cho, who are my #kimchisisterhood. They sustain me on Voxer when being a Korean American woman writing in a largely white dominant industry is… trying. Also, they are all talented writers and speakers and they make me braver. I also have great respect for Helen Lee and the work she does at IVPress to market thoughtful quality books written by POC, even though I’ve never met her. And I’d eat anything if I got to be with them in person and share a meal but if it’s in my dreams it’d be Korean food and I’d order bibimbap or Kimchi Jjigae and we’d all share banchan and laugh way too much. Jenny from Twitter: What authors, poets, essayists, etc influence your writing life? Alia’s answer: So many! I can’t possibly name them all because I read a ton. I primarily read fiction and memoir so my influences tend to be novelists. I’ve been most heavily influenced by Mary Karr, Amy Tan, Jesmyn Ward, Anne Lamott, Bryan Doyle, Mary Oliver, John Blase, Marilynne Robinson (her novels, not her essays-her essays are too smart for my brain), Brennan Manning, Sandra Cisneros, James Baldwin, Langston Hughes, Fyodor Dostoyevsky, James Herriot, Kent Haruf, Louise Erdrich, Henry Nouwen, Dorothy Day, Leif Erikson, Maya Angelou, Jane Kenyon, Ted Kooser, WS Merwin, I could go on and on and on. Everything I read influences my writing life, even if I think it’s bad writing, at least I’m learning what not to do. Language needs to be ingested regularly to produce anything worthwhile. If you’re not gobbling down and savoring words on a regular basis, your work will come out anemic and limp. You want red-blooded words, robust and hearty and ready to work for you. You only get that from reading wide. Margaret from Twitter: Favorite taco? Grilled fish street tacos with tomatillo jalapeño salsa, they’re so spicy, they melt my face off while I eat them. It’s heaven. Vivian from Twitter: Favorite Lipstick? MAC Lady Danger but Ruby Woo is a close second. Red lips make me feel brave. I actually have an essay in a book called Everbloom that is an ode to Mac’s Lady Danger. And NYX- lips gloss in LONDON. It’s brown but not like a ’90s 90210 brown complete with over-lined lips. Vivian from Twitter: A writing tip or practice? When I get super stuck, I read my thesaurus and look for words I’d like to play with. I once wrote an entire essay because I wanted to use the word corrosive. For more writing tips, you can check out this Patheos article I wrote. Find Alia on Instagram, Facebook, and Twitter! Sign up for her newsletter. For more of Jennifer’s music: http://www.jenniferchung.com/. Singer-Songwriter Jennifer Chung is an Atlanta local who creates storytelling content with her husband, Joules. On top of music, she's a social media strategist and manager working with brands like Leonard & Church, Judy Blue Jeans, and an Atlanta non-profit, We Love BuHi. Find Jennifer on her website, Instagram, YouTube, and Twitter! The theme of season 3 is “Create.” This season is full of inspiring conversations with women of color who are creators, creatives, founders, visual artists, performing artists, and businesswomen. If you are looking for practical tips on how to kickstart your creativity and action steps that will lead you toward your dreams and passions, then these episodes are for you. To kick off this season’s theme, check out Amena’s mini-talk “The Mystery of Creativity” from Creative Mornings Atlanta and what making a cake with her grandma taught her about creativity. Click here for the episode transcript. Amena talks with Micky ScottBey Jones, also known as The Justice Doula, about life after divorce. Micky shares how her work as a birth doula informs her current work in justice and activism. Micky also shares her personal experience of divorce and gives practical tips for those walking through divorce or walking alongside someone else going through a divorce. For more information about Micky and her work with Faith Matters Network and The People’s Supper, visit https://www.faithmattersnetwork.org/. Find Micky on her website and Twitter! Amena talks with podcaster and education advocate, Dr. Alma Zaragoza-Petty, about how she overcame obstacles on her path to education. Dr. Zaragoza-Petty shares the barriers first generation students encounter on their path to higher education and why it’s important for marginalized people to pursue higher education. For more information about Dr. Alma and The Red Couch Podcast visit http://redcouchpodcast.podbean.com/. Find Alma on Instagram and Twitter! On this bonus episode, Amena talks with actress Javicia Leslie who is featured on the CBS show God Friended Me. Javicia shares her audition journey and what she’s learning from playing her character, Ali, who is sister to an atheist podcaster brother and daughter to a traditional reverend father. Javicia also shares why it’s important to be persistent in pursuing your dreams. For more information about God Friended Me, check your local listings and visit https://www.cbs.com/shows/god-friended-me/. Find Javicia on her website, Instagram, Facebook, and Twitter! 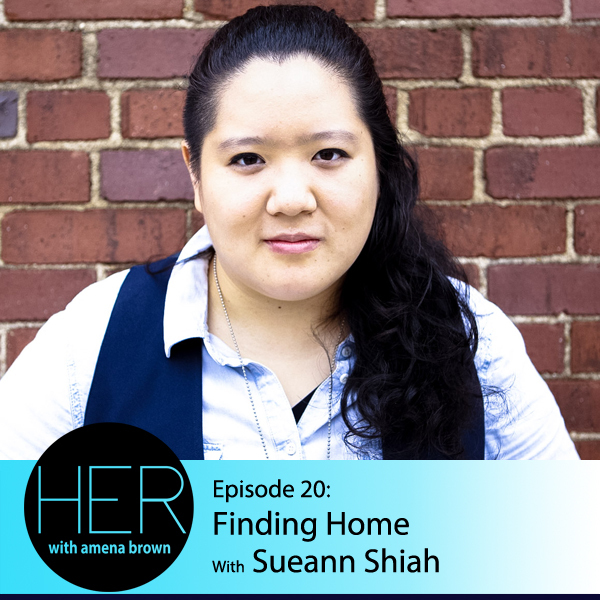 Amena talks with musician, filmmaker, and emerging theologian SueAnn Shiah. SueAnn shares the journey of making her documentary HuanDao about her return to her parent’s home country Taiwan for a biking pilgrimage. Amena and SueAnn talk about the power of indigenous music and how returning to a familial home can help us to find what has been lost. For more information about SueAnn and her documentary, visit https://www.sueannshiah.com/. SueAnn Shiah (@sueannshiah) is a Taiwanese American musician and filmmaker and emerging theologian specializing in identity formation, racial justice, gender, and sexuality. Her first feature length documentary HuanDao premiered in Fall 2016 in Nashville, TN. Her debut solo album of reclaimed hymns “A Liturgy for the Perseverance of the Saints” just came out on June 22, 2018. In addition to her own creative and theological works, she collaborates with other artists and musicians in a variety of capacities as an artist manager, producer, audio engineer, songwriter, and creator of liturgy. She has a B.B.A. in Music Business with a Production emphasis and a Chinese minor from Belmont University and is set to attend National Taiwan University in Fall 2018 to pursue a Masters of Arts in Musicology. Find SueAnn on her website, Instagram, Facebook, and Twitter! Amena talks with author, poet, educator and poetry slam champion Theresa Davis about how we can use writing to process grief. Theresa shares how she became a performing artist and how she teaches young students to use writing to process difficult emotions. Amena and Theresa discuss helpful ways to walk alongside someone who is grieving. For more information about Theresa, visit www.theresa-davis.com/. Find Theresa on Instagram, Facebook, and Twitter! The Running Over Coffee Co.
Find Kat on her website and Twitter! Amena talks with author, speaker, leadership coach, visionary, and podcaster, Jo Saxton. Amena and Jo discuss healthy leadership and the tensions between what we perceive as leadership and what leadership looks like in real life. Based on the themes in her book The Dream of You, Jo shares how we can center our identity in the right place and heal where our identity is broken. For more information about Jo, visit https://www.josaxton.com/. Find Jo on her website, Instagram, Facebook, and Twitter! Amena talks with international speaker, leadership consultant, diversity and mentoring coach, and author Natasha Robinson. Exploring the themes of Natasha’s new book, A Sojourner’s Truth: Choosing Freedom and Courage in a Divided World, Amena and Natasha discuss Beyonce’s “Formation,” navigating the wilderness of life, and where we we can find redemption as we seek love, justice and freedom. For more information about Natasha and to order her book visit http://www.natashasrobinson.com/. Find Natasha on her website, Instagram, Facebook, and Twitter! The theme for Season 2 is “Lost and Found.” This season Amena and her guests explore themes of surviving and processing loss, finding the joy in getting lost, returning home, finding freedom, and building something new. Listen here for a live performance of “Here Breathing” which inspired Amena to curate this season’s theme. Amena talks with Native American author, speaker and worship leader Kaitlin Curtice about why the voices and leadership of Native leaders is necessary and important. Kaitlin shares about her book Glory Happening and how the process of laboring is important in many areas of our lives. To find out more about Kaitlin Curtice, visit https://kaitlincurtice.com/. Kaitlin Curtice is a Native American Christian author, speaker and worship leader. As an enrolled citizen of the Potawatomi Nation and someone who has grown up in the Christian faith, Kaitlin writes on the intersection of Native American spirituality, mystic faith in everyday life, and the church. Find Kaitlin on Facebook and Twitter!